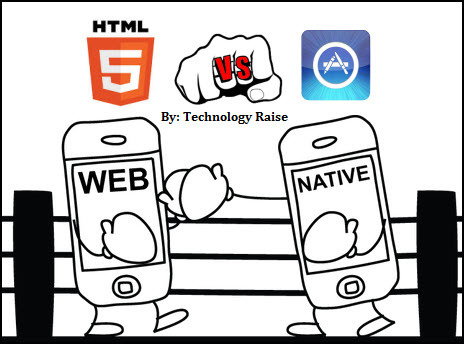 "Native Mobile Apps Vs HTML5 Mobile Apps" Which one should you go for? It is very much certain that mobile applications, these days, are out there on the market shelves like popcorn's. But then, not many of these apps serve their intended purpose to good effect. Thinking mobile first has undoubtedly become the foremost preference for today’s web technologists. There’s, therefore, an avalanche of mobile applications on the market shelves nowadays. Amidst this fierce competition, there’s still one important aspect separating different businesses in the segment: knowing which platform to be used for developing mobile applications. Here today we aim to provide you better guidelines for developing mobile applications within your organization by comparing the two most serious contenders for mobile apps development platform, i.e. HTML5 and native application development platform. Let’s have a look at what’s best for your organization and in which technology should you invest in order to maximize the Return on Investment (ROI), customer outreach and the worth of your developed application. Native applications are developed only for a single mobile-based OS such as Android or the Apple iOS, and are distributed using proprietary app stores. Quite the reverse, Web-based mobile applications written in HTML5 exist online. Such apps can be easily downloaded and used for mobiles or tablets based on almost any operating system. Current market trends highlight a strong inclination towards the use of native apps as they are, still, the favorite among consumers across the globe. HTML5 seems to be losing its way against native apps; however, you must not underestimate the value of mobile apps developed in HTML5. In clear terms, HTML5 is lost but not dead. HTML5 apps also do have a handful of benefits such as comparatively easier, widely-known programming language and simpler interface as compared to native apps, though these advantages are far too less to make a match of it. And then, against the general feelings of HTML5 lovers who comment that this downfall in mobile Web apps is merely a small-time bump, it seems like the road ahead is not very rosy for HTML5 mobile apps. However, native apps also face a few hurdles like their development is time consuming, they have to deal with the licensing processes of Google or Apple app stores, they can be developed only for a specific mobile platform, etc. Still, the modern-day consumer is highly fascinated by these apps and the developers get high revenue streams. To sum it up, native mobile apps are going to go places and you would do well to follow them.